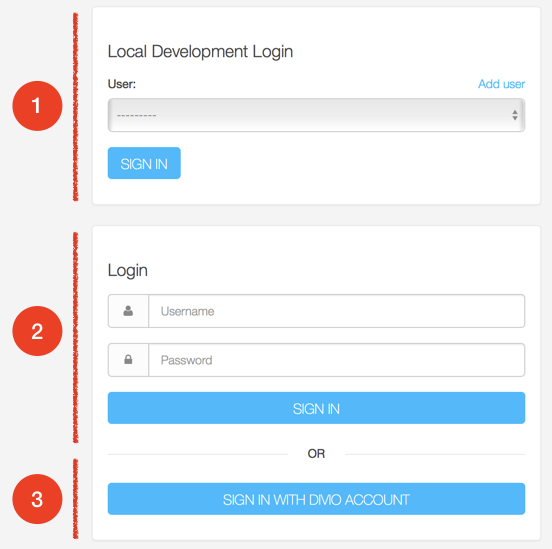 Authentication to the Divio Cloud platform, and (by default) to user projects running on the platform, is handled by the Divio Cloud SSO (single-sign-on) system. This provides a convenient way to authenticate users for Divio Cloud projects (whether locally, or on the Test or Live servers) without needing to log in again, as long as they have logged into the Divio Cloud Control Panel. This includes making it possible for users working on projects locally to log in locally with a single click, as they have already been authenticated. Divio Cloud SSO is managed by the open-source Aldryn SSO addon. The system is optional, but is installed by default in all Divio Cloud Django projects. If the addon is uninstalled, then Django’s standard authentication behaviour will apply. Depending on how the project is configured, and which environment (local/test/live) it’s running in, different combinations of these options will be shown (you’ll never see all three at once in a real project). This is intended to appear on locally-running projects only. The Add user option is a convenient way to add new users to a project. This will not be of any use unless users with passwords exist in the database. This is intended to appear on projects running in Cloud environments only. It allows users to sign in to their own projects with a single click, once they have authenticated with the Divio Cloud control panel. By default the Test site is protected so that it’s not publicly discoverable or viewable. by being logging in as a user who is the owner or an authorised user of that site. This URL can be shared with other people - for example, if you need to show progress on the Test server to someone who doesn’t have a Divio Cloud account. Most of these options must either be provided as environment variables, or as settings that are declared in settings.py before aldryn_addons.settings.load(locals()). This allows them to be processed correctly by the addons system. More details of how Aldryn SSO processes these settings can be studied at aldryn-sso.aldryn_config.py. When True (default for the local environment only) enables the Add user pane in the login form, providing a convenient way to add a new user to the database. Can also be specified as an environment variable or in settings.py. For obvious reasons, enabling this is strongly not recommended on the Test and Live sites, and there is generally no good reason to manipulate this setting. Requires a value to be present in SSO_DSN, and is automatically set when there is. If enabled when no SSO_DSN value has been set, an error will be raised. Enables Django’s standard username/password login form. By default, is enabled when Hide user management is not enabled. When True (the default on all sites) then if SSO login is the only login method enabled, the user will be automatically logged-in via SSO (assuming of course that the user is authorised to do so). True: Users will need to log in via the SSO system in order to access the site (default for test site). False: No login is required (default for local and live environments). basicauth: The site will be protected by basic HTML access authorisation. See basicauth. This option is presented in the configuration form for the Aldryn SSO addon on the Control Panel (as Hide user management). Its effect is to unregister the User and Group models in the Django admin. Setting it as an environment variable will have no effect. Specifying it in settings.py will only have an effect if it is declared after aldryn_addons.settings.load(locals()). This is not recommended except for testing purposes. For local testing, the hide_user_management value in aldryn-addons/aldryn-sso/settings.json can be changed, mimicking the effect of the form value. When ALDRYN_SSO_ALWAYS_REQUIRE_LOGIN is set to basicauth, access to the entire site will require user and password details. This is an additional layer of authentication. Access to the admin will still require login by an admin user, and even a logged-in admin user will need to supply the username and password. How to set up project-wide password protection. Though the username and password can be specified as an environment variable or in settings.py, the latter is not good practice. The Data Source Name for single-sign-on. This is set as an environment variable automatically in Cloud Projects, adding the SSO authority to the URL configuration for the project. If you are providing your own single-sign-on, SSO_DSN can also be specified as an environment variable or in settings.py. After login, redirect to the specified URL (by default, to /). Specifying LOGIN_REDIRECT_URL in settings.py will only have an effect if it is declared after aldryn_addons.settings.load(locals()). A list of internal endpoints that don’t require authentication. Defaults to an empty list. We override Django’s admin login view by default, as long as one of the three login options is enabled. This takes better care of logged-in users who are not staff (admin) users. The standard Django administration login view is available by setting this to False as an environment variable or in settings.py.